I have always been in love with coloured natural hair, but haven’t really had the courage to dye my hair because of the numerous things I have heard about it. I heard there’s more tendency for one’s hair to get damaged, one must up moisture, deep conditioning, and protein treatment (which I have never really been a fan of), etc. Basically, in my bid to retain as much length as possible, I stayed away from colouring my hair, so it won’t lead to tears. But after my unplanned hair cut incident, I began to wonder if this was not the time to take that plunge. What was the worst that could happen? Hair damage! I was already down anyway, and he who is down fears no fall. But still, I did not have the courage. A week and half ago, I heard that we could use hibiscus powder to colour natural hair red, by using it as a mud paste, or mixing it with henna. Since it is a natural hair colour option, every remaining fear of hair damage flew out of the window, and I finally decided to bite the burger. I already had some dried hibiscus flower at home, because we actually take the hibiscus drink a lot in my house. So all I did was grind it into the powder. I had planned my colour treatment for Saturday, but couldn’t do it until the evening time, due to an impromptu church departmental meeting. I got home later in the day, and there was no light. Thanks to the Nigerian situation, I have grown accustomed to doing a lot to my hair, with just a torch light. I mixed the hibiscus with a little coconut water, in order to form a paste, and the proceeded to the bathroom to do the treatment. The first thing I noticed was its inability to stick to my hair, like other ayuverdic treatments like henna, clay, etc. After minutes of forcing the paste all over my hair, and grappling with the pastes falling all over the bath tub, and me picking and repasting on my hair, I was able to get something done. I then put a plastic bag on my head, and went about my business. Four hours later, when it was time to wash, there was still no light. I proceeded to the bath tub and washed the whole thing off. I looked at my hair in a mirror, and I did not notice any change in colour, but my hair felt very great to touch. 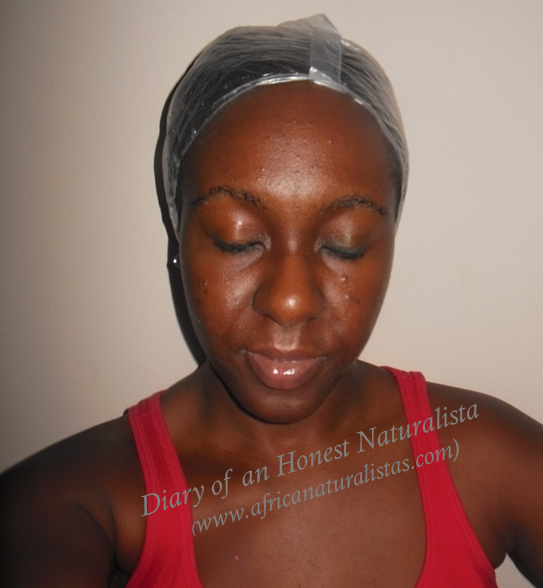 My scalp felt refreshed, and I felt my whole hair was reborn, but no colour! I was quite downcast that my dreams of red hair without having my hair damage had just been dashed. “Anyway, it was a good experiment,” I thought. After about 1 hour, about 12 midnight this time, I lay on my bed to sleep. As my eyes were closing, power was restored, and I silently cursed the PHCN authorities for not knowing the right time to give us light. Where were they when I needed them the most? With this, I succumbed to the beckoning journey of dreamland. At about 5.00 am, I heard my mum’s scream. I first of all thought it was in my dreams, so I just turned around, and adjusted my sleeping position. I heard another scream, loud and clear this time around. I was about to start wondering why the alarm, cos as you all know, my mum can be a drama queen, when I heard a third scream, and this time, it had my name suffixed to it. To be honest, I was momentarily confused. I really didn’t know what was happening, if I was dreaming, or when last I even went to the bathroom. “Wha…att?” I drawled, still sleepy-eyed. Before I knew it, my mum was at my bedside, dragging me out of my bed. In seconds, we were in the bathroom, and she turned my face to the bath tub. One look at the bath tub, and I instantly woke up. This was not a dream anymore, it was reality. The bath tub and even the bathroom walls were a sight to behold. “Ahn ahn, blood?” I finally opened my mouth to utter one audible sentence. “I won’t be surprised. After all there is nothing you can’t put on that hair of yours. So is it wine?” She continued. “I don’t even care. All I know is that I am leaving this place now, and by the time I come back, this bathroom should be as white as snow. Kpschewwww. One day, you and your hair will leave this house for me, if this is how you want to keep tormenting us. ” And with that, she stormed out. Let’s just say I spent three hours scrubbing off hibiscus stains off the white ceramic tiles and bath tubs. This hibiscus definitely had a mind of its own. If only it had coloured my hair the way it did the whole bathroom, then maybe the torture would have been worth it, and my mum’s screams would have been more bearable. I think you should have used the Juice instead of grinding the leaves. The juice doesn't dye hair. Yea, I think its always best to mix henna. Actually, I have seen the video before, and she wasn't able to get the red colour. Kpele. The things we do all in the name of healthy hair. Should be henna and indigo. How do one get indigo? lool...I can imagine. and I feel the same about dyeing my hair, Love it but I am scared of how the result would be. I might eventually do it...one day one day. Since your hair is still short, I will say now is the time to take the plunge. Your backyard? You are even more of a case than Anna, lol. Lool wow. Our mothers ! No courage to dye my natural hair yet. Taking baby steps. Installing an almost fully blonde weave after next week. Anticipating. Lool. We are waiting on you to do something more daring than blond braids. naturals with all our wahala,trying so many things,i dont think hibiscus can dye our hair and the colour comes out, even with henna,you have to repeat it so many times.so i say better luck next time. I actually know someone that dyed her hair read with the henna hibiscus mix. Several people have also recorded their successes, online. I think its just not as bright as using a real dye. Funny and educative, I have learnt somethings here. Thanks. Funny and educative, I just learnt something now. I read this post in the office i cant but burst out in laughter. I am having ideas too, will try this pretty soon.